In our quest to reduce our landfill-based trash, but really to reduce any trash at all, I spend more time than I'd like actively asking companies to stop sending me mail. This past semester, I'd saved up a bunch of offending mail for a massive "please stop" blitz, and yesterday was that blitz. I'm really grateful for Catalog Choice (https://www.catalogchoice.org/). They can't help with EVERY company, but when a company is on their list, stopping mail is just a click or two of trouble. In fact, I'm so grateful that I gifted them a little $100 donation as my final charitable contribution of the year. I'm also getting low on my "Please remove us from your mailing list" stickers that I use with credit card offers and other stuff that comes with returnable envelopes. And then I spent a bunch of time on the phone. 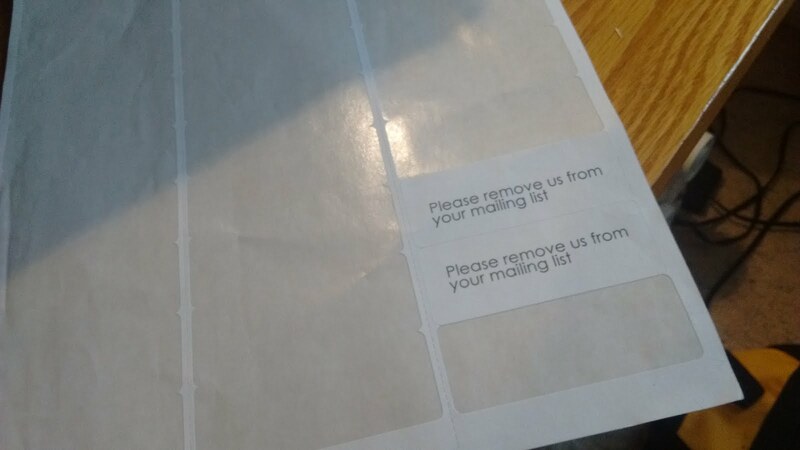 "Please remove us from your mailing list"
Stickers are almost all gone. . .
All told, I think I spent about an hour and half. Sheesh. 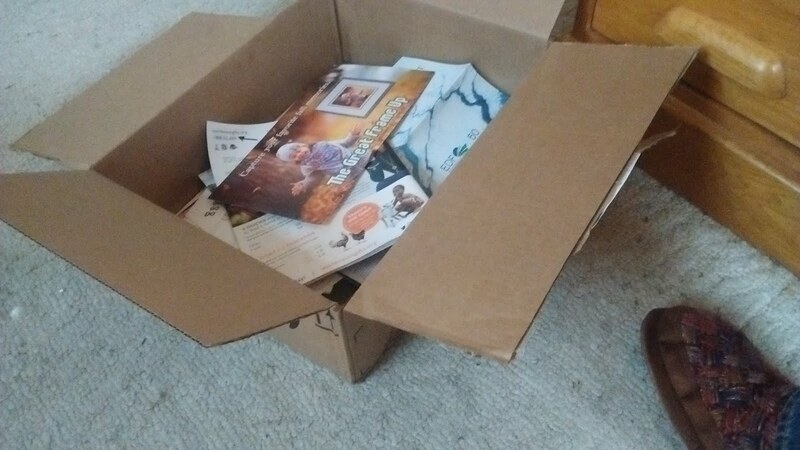 A box of unwanted (glossy) mail. The office-paper mail is in another box. Technically, most of this unwanted mail is "recyclable", but it's getting harder and harder to find places that want to recycle it. In my area, there's one recycling center that accepts well-sorted donations, but they do it as a kindness: office paper actually loses them money. (Other things like chip board and aluminum are money makers, provided it's well-sorted and clean, which is why they're so careful about what they accept). And as long as we're on the subject, I'll just note in passing that we've achieved a record low number of trash cans at the curb: we put 6 (six) cans at the curb in 2018 [insert small celebration noises here]. A huge part of the reduction is that we had a similar reduction in the number of people in the house -- only 3 of us living here full time now. And because I love graphs, that's how I'll end this post. Thanks for this post. I've been meaning to try to get off of the mailing lists for the charities I support. (I support them. I just don't support getting mail at least once a month asking for more money!) You've inspired me to get on that. My first call was to the Arbor Day Foundation. Receiving so much unwanted mail from them seemed downright insulting! Isn't that sadly ironic?! One of my new biggest too-much-mail offenders is the Environmental Defense Fund, even though I included a note with my donation saying "stop sending so much mail!" Apparently they read the check but not the note. I have to try again; sigh. I also spend way too much time doing this on a regular basis. I had forgotten all about catalog choice, though, thanks for the reminder! I'm overdue for another round. Sigh.